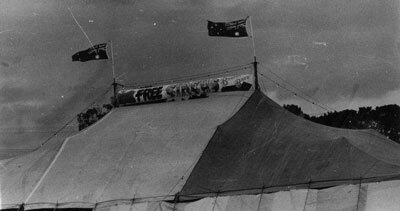 When the circus first performed under canvas in Australia in the early 1800's, the tents were made by the circus people themselves. The entire family would be involved in the making, which would take months of sheer hard work. First a huge rope structure would be spliced together in a frame similar to a house frame. Using as much as 1000 metres of calico, this would be cut, joined and sewn by hand onto each section of the rope frame. To waterproof the calico, a mixture of kerosene and melted paraffin wax would be swept into the material and allowed to dry. Unfortunately the calico was prone to Black Spot Mildew. If a section rotted away it could be cut out and replaced with new material, with the result that many of the early tents resembled a huge patchwork quilt. By the turn of the century, the rope frame was replaced with wire cables to take the weight of the much heavier fabric, (going from calico to sailcloth then to canvas. The little one pole calico tent, seating around 100 people, now became a huge canvas marquee with seating capacity of over 2000 people, with 2, 4 and even 6 king poles, with remarkable animal acts, daring trapeze artists and the unforgettable clowns performing. At one time, there was even a 2 pole marquee called the Cannon Top. This tent was open to the sky, directly above the circus arena and was first used by Albert (Bert) Bibby for his cannon act, where a performer was fired from a cannon through the top opening of the tent, into a safety net outside the marquee. This tent proved to be a windfall for the buck-jumping shows where the dust from the horses could easily disperse, although not so good for the performers on a wet night. Circus people were very adaptable in the early days. Using their skills as performers and with their horsemanship opening buckjump shows such as Lance Skuthorpes Wild West Show, The Gill Bros. Rodeo, Bibby Bros. Circus and Buckjump Show, Dolly Baker's Snowy River Stampede, Thorpe McConville's Wild Australia and not forgetting Sideshow Alley, with the boxing tents. Jimmy Sharman, Roy Bell, Big Les McNab, Fred Brophy, The Moore Bros., Sandy and Selby, these are just a few of the wonderful entertainers that travelled Australia using canvas tents. The last canvas tent made by a family of circus performing people was made on the Granville Showgrounds by the Urban Family. Robert Urban is the head of the family, who came to Australia from Europe, an extremely talented family renowned for their Trapeze expertise, Balancing Acts, Wire Walkers and Animal Trainers. After working in some of the largest circuses in Australia, they decided to operate their own Circus. The entire family spent many months sewing the canvas on a "Singer" treadle machine, splicing the wire cable and hand sewing the gussets to the bale rings, through as many as 12 thicknesses of heavy canvas. The Bale Rings are then attached to the King Poles. In the 1990's circus marquees were rapidly replaced by a colourful plastic material known as PVC, so canvas became obsolete. The Brophy Bros. Circus decided back in 2002 that their canvas tent, now long retired, would make a wonderful background for a series of artworks, showing the history of Show Business in Australia. The artworks were painted by the family's matriarch Norma Brophy. Using on the outer rim of the canvas and incorporating the lacing ropes, eyelets or webbing into each painting, showing all the aspects of Show Business. The Road Trains and Camp Fire gatherings, Children at Play, Work and School, The Wood Chops and Side Show Alley with the massive Thrill Rides and Sideshows, The Circus Acts, Clowns and Animals, The Erection of the tents and the Buckjump Shows, "Rodeo" with their wonderful bucking horses and riders. In fact, all the outdoor performing Industry, which goes into making this world of entertainment a part of Australian history.